We started today after a good breakfast in Cahors with an autoroute trip past Toulouse stopping for lunch at a service area on the banks of the Canal du Midi. Our next call was at Castelnaudry where I made a sketch of the canal and watched a boat through a staircase lock. Then on we came to Carcassonne where our hotel proved to be right on the canal so we had a beer and watched some more boats before the half hour walk to the old cite. After a wander through the heaving mass of tourists I sat outside the church and sketched the same scene I have painted before. We decided to have dinner in the Old Cite/Castle to see if it got quieter later. (it did but only a bit) We both had cassolet as a main course, of course since this is where it comes from, which I knew as a fan of Rick Stein. 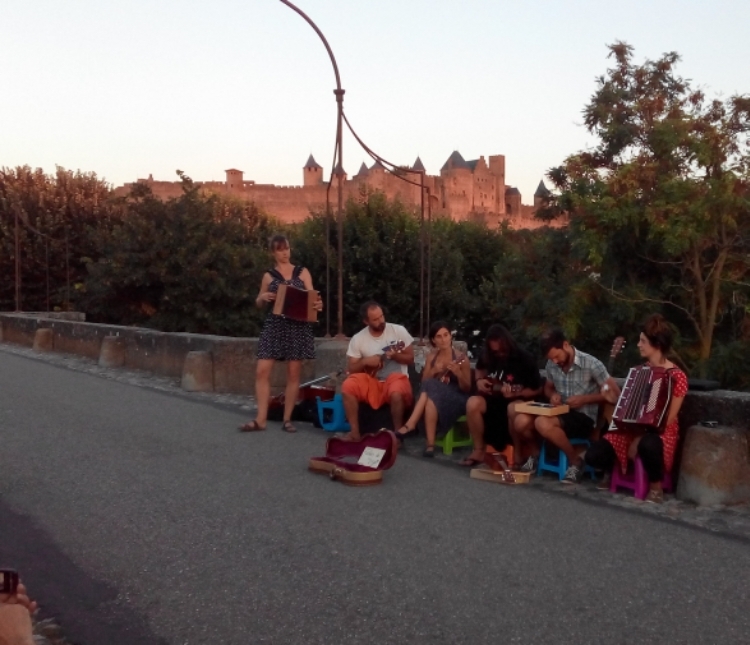 Walking back over the ancient foot bridge as it began to get dark we came across a group of musicians setting up so we stopped and listened for nearly an hour as the sun set on the ramparts behind them.